Lord Falconer’s Assisted Dying Bill, due for a second reading in the House of Lords on 18 July, is purportedly based on the US state of Oregon’s Death with Dignity Act (DWDA). The Oregon and Washington laws, like Falconer’s proposed law, have ‘six months to live’ criteria. But doctors’ estimates of lifespans can be wildly out. Consider Oregon resident, Jeanette Hall, who was diagnosed with cancer and decided to ‘do’ Oregon's law. Her doctor, Kenneth Stevens, didn't believe in assisted suicide and encouraged her to be treated instead. It is now 14 years later and she is ‘thrilled’ to be alive. This is Dr Steven's affidavit filed by the Canadian government in Leblanc v. Canada, now dismissed, discussing Jeanette. This is Jeanette's affidavit, also filed by the Canadian government in the same case. 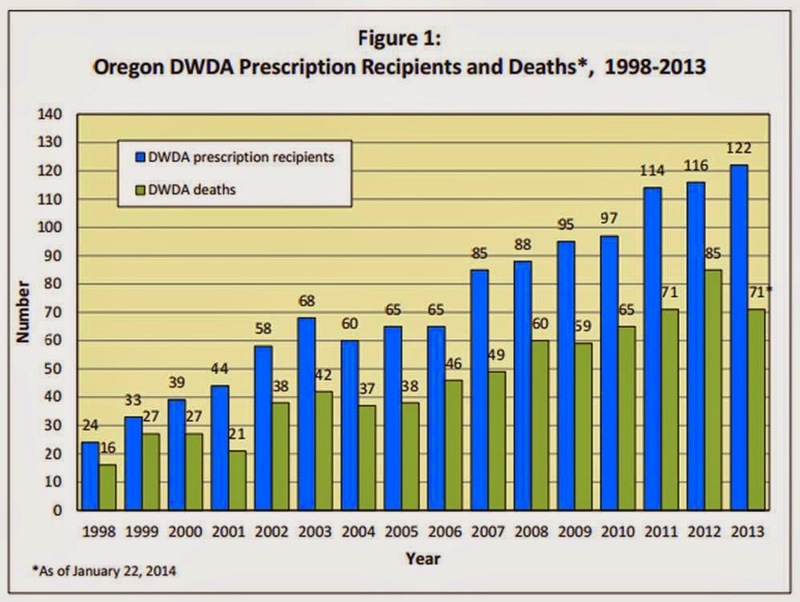 The Oregon statistics record patients killing themselves up to 1,009 days after the first request for lethal drugs – almost three years – showing just how hard doctors are pushing the boundaries - and/or how bad they are at guessing lifespans. The main argument advanced for assisted suicide is unremitting pain. But the Oregon data show that those people citing ‘inadequate pain control or (even) concern about it’ constitute just 23.7% of cases overall. So what are the main reasons given for taking one’s life? In 2013 93% cited ‘loss of autonomy’, 89% said they were ‘less able to engage in activities making life enjoyable’ and 73% listed ‘loss of dignity’. These are not physical but existential symptoms. But should lethal drugs be prescribed to people who feel their lives no longer have meaning and purpose? I have frequently argued that any change in the law to allow assisted suicide or euthanasia would place pressure on vulnerable people to end their lives for fear of being a financial, emotional or care burden upon others. This would especially affect people who are disabled, elderly, sick or depressed and would be most acutely felt at a time of economic recession when many families are struggling to make ends meet. This fear is again borne out by the American data. In Washington in 2013, 61% of people opting for assisted suicide give the fear of being a burden to family, relatives and caregivers as a key reason. 13% cited ‘financial implications of treatment’. In the same year in Oregon the equivalent figures were 49% and 6%. Many of these conditions might be considered life-shortening but it beggars belief that all these cases were terminal (with less than six months to live). These are in the main chronic conditions, again falling outside the bounds of the Act. And yet the doctors went ahead and signed the forms anyway – further evidence of how medical practitioners cannot be trusted to keep to the legal boundaries. Oregon officials in charge of formulating annual reports have conceded ‘there’s no way to know if additional deaths went unreported’ because Oregon DHS ‘has no regulatory authority or resources to ensure compliance with the law’. So with an Oregon-type law like Falconer’s we can expect to see steadily increasing numbers of assisted suicide cases year on year in England and Wales, along with an unknown level of under-reporting. In order to assess whether a patient is being coerced or not, it surely must be necessary for the prescribing doctor to know them personally and understand their family situation. But in Oregon there were patients who knew their doctor for less than a week before he/she prescribed them the lethal drugs – further evidence of doctor shopping. During this time the drugs were kept at the patient’s home. But without an independent witness how can we be sure that the drugs were taken voluntarily and not administered forcefully or secretly by a relative with an interest financial or otherwise, in the patient’s death? If they struggled who would know? And any investigation into possible foul play would have to traverse the substantial hurdle of the key witness (the patient) being dead. We know that in Britain, according to ‘Action on Elder Abuse’, there are half a million cases of elder abuse annually, many of which involve financial abuse by family members or close relatives. The Oregon law, and by implication Falconer’s proposed law, is a recipe for elder abuse of the very worst kind – killing for money. 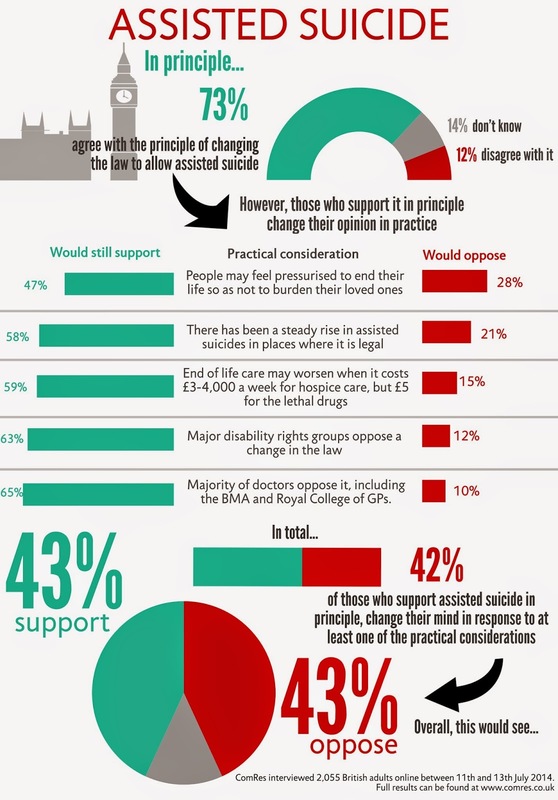 There is ample poll data showing that the majority of the British public support legalising assisted suicide (AS) in principle. The former Voluntary Euthanasia Society (now rebranded Dignity in Dying) claims a figure of 80% although I have previously argued that such levels of support are uncommitted, uninformed and unconvincing. However, there has been very little poll data gauging public attitudes in light of the various empirical and rational arguments against AS. That is, until now. An extraordinary new poll has demonstrated that public attitudes change dramatically once some of the key practical implications of AS are considered. 73% agreed (38% strongly), 12% disagreed and 14% were in the ‘don’t know’ category. So far there’s nothing that surprising. It would be odd for people not to be moved by some of the tragic stories of the ‘hard cases’ and to say they support a means of alleviating such suffering. But then those who supported AS in principle were asked which of the following arguments would make them change their minds. Each statement below was randomised throughout the survey in order to assess which argument moved opinion the most. The answers were truly astounding. Overall 42% of those who originally supported the bill changed their mind on the basis of at least one of the arguments. 43% support AS, 43% oppose it and 14% don’t know. So hearing the arguments against AS causes support for AS to collapse from 73% to 43% - that is, to less than half! Here are the arguments with the percentage change each cause on those who initially backed Falconer’s proposals. On hearing this 47% of those who originally backed Falconer’s proposals would still do so, but 28% would oppose him and 25% did not know. 58% would still support, 21% would oppose and 215 didn’t know. 59% would still support, 15% would oppose and 27% didn’t know. 63% would still support, 12% would oppose and 25% didn’t know. 65% would still support, 10% would oppose and 25% didn’t know. Polls consistently show between 70% and 80% in support of AS. However, the issue is clearly far more complex than a simple ‘support’/’oppose’ question can do justice to. This polling strongly suggests that when offered evidence about the nature or source of opposition to AS, and some of the key arguments against it, this high level of support rapidly dwindles. The most powerful argument in swaying the public was that changing the law would place pressure on vulnerable people to end their lives for fear of being a burden on friends, family or caregivers, as has been the experience in the US state of Washington and Oregon. In short, support for AS looks to be extremely soft and generally uninformed. METHODOLOGY: ComRes interviewed 2,055 British adults online between 11th and 13th July 2014. Data were weighted to be representative of all GB adults aged 18+. ComRes is a member of the British Polling Council and abides by its rules. On the eve of the House of Lords’ debate on Lord Falconer's Assisted Dying Bill, Care Not Killing, an alliance of 40 organisations, has called on peers to reject the proposed legislation on grounds of public safety. Elder abuse and neglect by families, carers and institutions are real and dangerous and this is why strong laws are necessary. Action on Elder Abuse, for example, states that more than 500,000 elderly people are abused every year in the United Kingdom. Sadly, the majority of such abuse and neglect is perpetrated by friends and relatives, very often with financial gain as the main motive. It would be very naive to think that many of the elderly people who are abused and neglected each year, as well as many severely disabled individuals, would not be put under pressure to end their lives if assisted suicide were permitted by law. Parliament has rightly rejected the legalisation of assisted suicide and euthanasia in Britain three times since 2006 out of concern for public safety - in the House of Lords (2006 and 2009) and in Scotland (2010) - and repeated extensive enquiries have concluded that a change in the law is not necessary. The mark of a civilised society and the first function of government is not to give liberties to the desperate and determined but to protect the weak and vulnerable. There is really something quite chilling about seeing the Care Minister backing assisted suicide as a treatment option for disabled and elderly people. But that is exactly what Liberal Democrat Minister Norman Lamb, the cabinet member responsible for providing care for people with dementia and other serious disabilities, has done today. 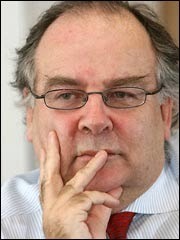 It is bitterly ironic that he has spoken out on the very day that the CEOs of four major charities representing elderly and disabled people have written to members of the House of Lords warning about the dangers of passing Lord Falconer’s Assisted Dying Bill and one day before disabled people’s representatives take to the streets of Westminster and the airwaves of the nation to protest. Falconer's bill is no less than a recipe for the abuse of elderly and disabled people. In Washington, where assisted suicide is legal under a law very similar to that proposed by Falconer, 61% of people opting for assisted suicide give the fear of being a burden to family, relatives and caregivers as a key reason. The pressure people will feel to end their lives if assisted suicide or euthanasia is legalised will be greatly accentuated at this time of economic recession with families and health budgets under pressure. It will quite simply steer them toward suicide. Elder abuse and neglect by families, carers and institutions are real and dangerous and this is why strong laws are necessary. Norman Lamb risks taking Britain down the Dutch and Belgian route where assisted suicide is seen as a cheap treatment option for people with dementia. The CEOs of four major charities representing elderly and disabled people have written to all members of the House of Lords to oppose Lord Falconer’s Assisted Dying Bill which is due to have its second reading on Friday. The letter comes from Gary Fitzgerald (Action on Elder Abuse), Janine Tregelles (Mencap), Richard Hawkes (Scope ) and Tony Hayes (Veterans Association UK) and is published in the Daily Mail. Especially in the current climate of austerity and economic pressure it is elderly and disabled people who will disproportionately take the brunt of it and be subtly steered toward suicide as the cheapest way of 'dealing' with their problems. We write as organisations representing large and diverse groups of people: those who are elderly, those of any age who are disabled, including those with mental health conditions, learning disabilities, autistic spectrum conditions and serious long-term and/or life-limiting conditions. We wish to express our profound concerns about Lord Falconer’s Assisted Dying Bill, due to have its Second Reading this Friday 18 July. An assisted suicide law would for the first time in this country introduce the idea that there are some people whose deaths can actively be brought about; whose suicide, unlike other people’s, society would make no significant effort to prevent and indeed would actually assist. Our organisations work every day with people in vulnerable situations who, whatever their medical condition, could lead a better life with access to the right health, palliative, social or mental health care. The crisis in care services and cases of neglect mean that comfort and dignity do not characterise the lives of a significant number of elderly and disabled people. For many, whether they have financial or practical support determines whether they live in an institution or in their own home; whether and at what time they get up and go to bed, eat a meal, wash, get dressed, see family and friends or go to work. Without support, many elderly and disabled people face isolation and poverty. The absence of such support creates avoidable dependency, undermines their dignity and limits their autonomy and choices. It is these wider social factors that could so easily create the context for people to feel they should ‘choose’ to end a life in which they are suffering, not just the symptoms of a particular condition, but isolation, avoidable discomfort and distress and the sense of being a burden to those who love them. In Washington State, where physician-assisted suicide is legal for those who are terminally ill, 61 per cent of all those given lethal drugs to end their lives listed feeling a burden on family, friends or care-givers as one of the reasons for wanting to die. We also have serious concerns about the Bill’s lack of safeguards, in particular its failure to properly address the issues of coercion and mental capacity. 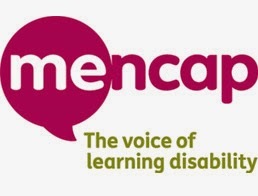 Mental capacity can be affected by many factors, including depression (whether in its own right or, as is often the case, co-existing with another condition), learning disability, autistic spectrum conditions and the effects of medication taken to relieve symptoms. Depression in particular can be difficult to diagnose or can be easily missed among those who also have debilitating physical symptoms. It is likely, diagnosed or otherwise, to relate as much to someone’s personal circumstances – where they live, who they see, what support they have, whether they face stigma or discrimination – as to their medical diagnosis. The Bill expects GPs to be able to confidently assess mental capacity in applicants for assisted suicide without referral for specialist assessment. With many pressing demands on them, doctors can fail to detect underlying problems such as lack of adequate social care or mental health support, family conflicts, money worries or depression. We see the impact of these problems every day. It is such experiences that characterise the majority experience among those who might request assisted dying, rather than the small minority who might have every comfort and support but who still find life intolerable. We also fear that the requirement to have a diagnosis of ‘an inevitably progressive condition which cannot be reversed by treatment’ could, despite reassurances that the Bill is designed to apply to a small minority of people, cover many long-term conditions such as dementia, multiple sclerosis, cancer and HIV. In some cases, available treatment does not reverse but slows progress of an illness and alleviates its symptoms – for example, artificial ventilation to help someone to breathe. Without it, many people would be ‘reasonably expected to die within six months’. In addition, prognosis at this range is notoriously unreliable. Where assisted suicide or euthanasia have been legalised, there has been significant expansion of the groups who qualify - whether through broadening of the definition by statute or through evolution of the way the law is interpreted - to include people with psychiatric conditions such as long-term depression and (in the case of Belgium) children. We strongly believe that the Bill would seriously undermine our efforts and lead unnecessarily to the deaths of many people whom as a society we should be helping to feel valued and to lead a fulfilled life. Because of these concerns, we urge you to oppose the Assisted Dying Bill. 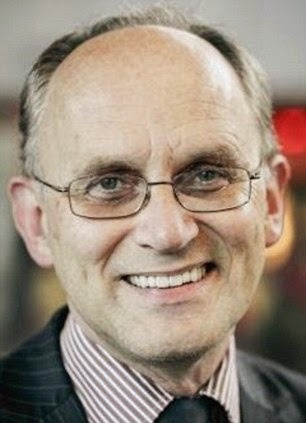 Professor Theo Boer (pictured) is a Dutch ethicist who was featured in by the Daily Mail last week for changing his mind on assisted suicide. He later agreed to send the original article that he had sent to the Daily Mail (who only quoted from it) to Alex Schadenberg, International Chair of the Euthanasia Prevention Coalition. The article is reproduced here, with permission, from Alex’s blog. In 2001 The Netherlands was the first country in the world to legalize euthanasia and, along with it, assisted suicide. Various safeguards were put in place to show who should qualify and doctors acting in accordance with these safeguards would not be prosecuted. 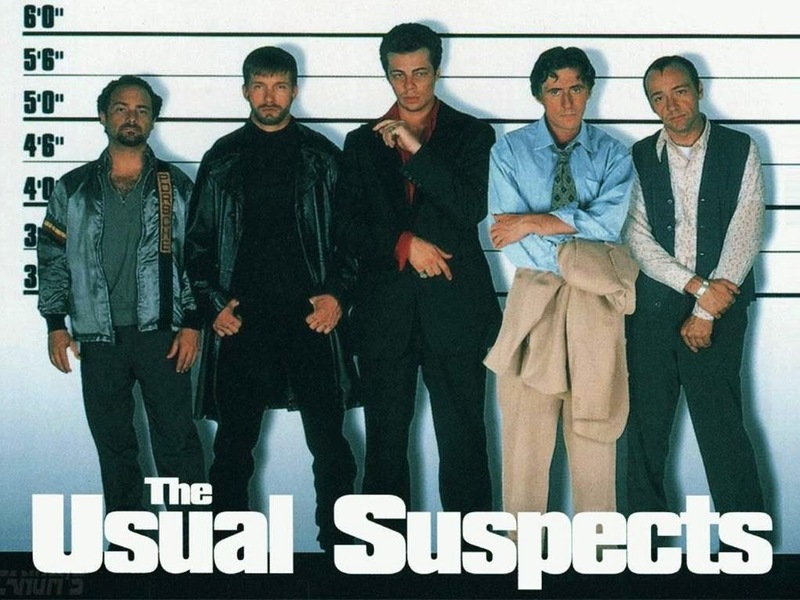 Because each case is unique, five regional review committees were installed to assess every case and to decide whether it complied with the law. For five years after the law became effective, such physician-induced deaths remained level - and even fell in some years. In 2007 I wrote that ‘there doesn’t need to be a slippery slope when it comes to euthanasia. A good euthanasia law, in combination with the euthanasia review procedure, provides the warrants for a stable and relatively low number of euthanasia.’ Most of my colleagues drew the same conclusion. Theo Boer is professor of ethics at the Protestant Theological University at Groningen. For nine years, he was a Member of a Regional Review Committee. For the Dutch Government, five such committees assess whether a euthanasia case was conducted in accordance with the Law. The views expressed here represent his views as a professional ethicist, not of any institution. 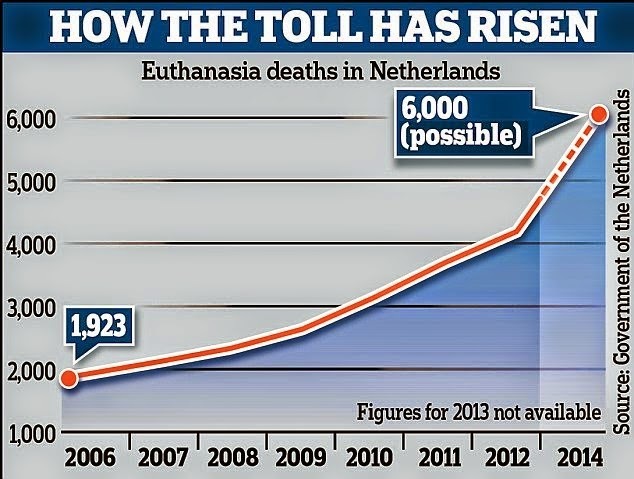 • Netherlands 2012 euthanasia statistics. • Euthanasia: Incremental extensions are inevitable. • Dutch health minister: 45 psychiatric euthanasia deaths in 2013. • Blind woman dies by euthanasia in the Netherlands. • Some Dutch pharmacists refuse to fill prescriptions for euthanasia. • Mobile euthanasia deaths begins in the Netherlands. The Cardinal Archbishop of Westminster, the Archbishop of Canterbury, the Chief Rabbi of the United Hebrew Congregations of the Commonwealth and the Secretary General of the Muslim Council of Britain are amongst the 24 faith leaders who have today voiced their shared concerns about Lord Falconer's Assisted Dying Bill. You can read their statement in full and see all 24 names along with descriptions listed on a number of websites and also reproduced in the Telegraph. These faith leaders are fully transparent about what they think and who they are. Contrast this with the ‘twenty-seven leading (medical) figures’ who, according to the Guardian, have written to peers asking them to back Falconer’s Bill. The Guardian gives only a few isolated quotes from their letter and names only five of the signatories. Of these five, three (Michael Rawlins, Graham Winyard and Terence English) are well-known members of Health Professionals for Assisted Dying (HPAD), the medical wing of the Voluntary Euthanasia Society, now rebranded Dignity in Dying. They are listed on its supporters’ page amongst HPAD’s 602 health professional members. Even if we assumed that all of these 600 or so were registered medical practitioners (and many are actually either retired doctors or non-medics) they would still make up only a tiny minority of the UK’s 260,000 registered GPs and specialists – to be precise less than a quarter of one per cent. I expect that we would find most of the unnamed signatories on the HPAD list as well – which may well be why the Guardian has opted not to tell us who they actually are. The two named signatories who don’t appear on the HPAD list are John Ashton, a well-known backer of assisted suicide, and Sir Richard Thompson, the president of the Royal College of Physicians. However, as the Guardian acknowledges, this means very little as The Royal College of Physicians (RCP) and Royal College of GPs (RCGP) are both opposed to assisted dying. In their most recent surveys of their members' views, 73.2% of hospital doctors and 77% of family doctors said they were against legalising it. The Guardian does not tell us that included amongst other official UK doctors’ bodies opposing any change in the law are the British Medical Association (BMA), the Association for Palliative Medicine (APM) and the British Geriatric Society (BGS). The British Geriatric Society in 2010 issued a strong statement on assisted suicide which outlined its concerns about how a change to the law would remove protection from vulnerable elderly people. The full statement is most worthy of study by all who take an interest in this debate. The World Medical Association (WMA) has also recently reiterated its strong opposition to euthanasia. The WMA similarly opposes assisted suicide. A 2011 study showed that doctors in the UK have opposed both euthanasia and assisted consistently over the past two decades. Researchers from Limerick, Ireland, used 16 key studies into doctors' attitudes between 1990 and 2010. The findings appeared in the journal Palliative Medicine and further confirmed the fact that those doctors who favour a change in the law, constitute a small vocal minority. The 27 ‘leading doctors’ quoted by the Guardian are merely part of that small vocal minority. They are entitled to their opinions but they do not speak for the medical profession. It is astounding that the Guardian has managed to manufacture a headline out of this tiny group, whilst apparently lacking the balls even to publish the text of their letter or reveal most of their names. We've asked them for more information but so far there has been no reply. The vast majority of doctors do not want Falconer’s Bill and it is disingenuous of the Guardian to try to suggest that it has serious or substantial medical support. The Archbishop of Canterbury has added his signature to a letter by faith leaders (see also here) calling for the Assisted Dying Bill not to pass through the House of Lords. ‘As leaders of faith communities, we wish to state our joint response to Lord Falconer’s Assisted Dying Bill. We do so out of deep human concern that if enacted, this bill would have a serious detrimental effect on the wellbeing of individuals and on the nature and shape of our society. Every human life is of intrinsic value and ought to be affirmed and cherished. This is central to our laws and our social relationships; to undermine this in any way would be a grave error. The letter comes just days after former Archbishop of Canterbury George Carey announced he’s changed his mind on the issue and was supporting a change in the law (see my critique of Carey here). 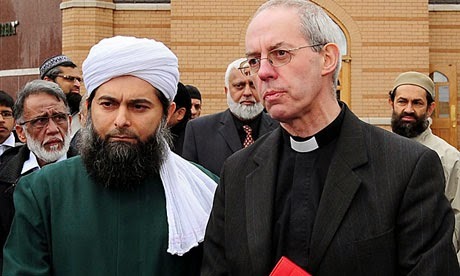 Along with the Most Revd Justin Welby, the statement has been signed by Chief Rabbi Ephraim Mirvis, Dr Shuja Shafi of the Muslim Council of Britain and Lord Indarjit Singh of the Network of Sikh Organisations. This latest stand comes in the footsteps of the unprecedented move by nine faith leaders representing the six major world faiths who wrote a similar letter to peers at the time of the Joffe Bill in 2005. The full, text of that letter can be read here. Anyone listening to Lord Falconer talking about his ‘Assisted Dying Bill’ on Channel Four last Saturday night would have been led to believe (by Falconer itself) that it applied only to patients with hours or days to live. They were being misled. The bill actually licenses doctors to dispense lethal drugs to mentally competent adults who have less than six months to live and a ‘settled wish’ to die. 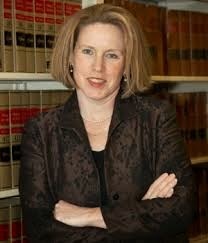 But according to Margaret Dore (pictured), a Lawyer in Seattle Washington, who has experience of a similar law, says that even six months may be a gross underestimate. She argues that ‘eligible’ patients may have years, even decades, to live. Here’s her account – the references are on her website. Consider Oregon resident, Jeanette Hall, who was diagnosed with cancer and decided to ‘do’ Oregon's law. Her doctor, Kenneth Stevens, didn't believe in assisted suicide and encouraged her to be treated instead. It is now 14 years later and she is ‘thrilled’ to be alive. This is Dr Steven's affidavit filed by the Canadian government in Leblanc v. Canada, now dismissed, discussing Jeanette. This is Jeanette's affidavit, also filed by the Canadian government in the same case. Margaret Dore is a lawyer in Seattle Washington the President of Choice is an Illusion. It is perhaps in the nature of celebrities to champion causes they perceive to be popular. Celebrity bishops are no exception and Desmond Tutu’s support for Lord Falconer’s Assisted Dying Bill is not surprising but deeply disappointing. Dignity in Dying, the former Voluntary Euthanasia Society, has assembled over 50 actors, sportsmen, entertainers, authors and other celebrities to add weight to their campaign - similar people to those advertisers draft in to provide endorsement for consumer products. The implication is that we should follow these celebrities and embrace their preferences. And there is no doubt that so-called ‘assisted dying’ resonates strongly with the spirit of the age and its commitment to the beliefs that personal autonomy should trump all other considerations, that it is better to be dead than to suffer and that there are no moral absolutes. These celebrities also fit the description of those who make most use of the law in the US state of Oregon – white, healthy, wealthy, college educated people who are used to being in control in life and want similarly to be in control in death. Desmond Tutu has always been popular amongst the metropolitan liberal elite who disproportionately occupy the corridors of influence and power in Britain – parliament, the institutions, universities and the worlds of the arts, entertainment and media, and particularly the BBC. His endorsement of the assisted dying cause will further strengthen their personal conviction that they are right. However there are elements of Tutu’s argument that I find deeply disturbing, which I believe are deeply damaging to social attitudes towards the vulnerable and which greatly endanger our future cultural trajectory. I would recommend that people read beyond the headlines of ‘Tutu embraces assisted dying’ and read his argument in full. It’s clear first of all that Tutu has been profoundly influenced by the death of Nelson Mandela and the way his life was artificially prolonged nearing the end. There are few people who would not sympathise with Tutu here. Life has a natural end. All of us are mortal. There is, as the good book says, a time to die. Intrusive ‘treatments’ at the end of life where the burden imposed on a dying person clearly outweigh any benefit should be avoided. Sometimes the treatment can be worse than the disease. We should not be ‘vitalists’, artificially prolonging life indefinitely just because we have the technology to do so. There comes a time when we must recognise that death is imminent, inevitable and that we are powerless to stop it, and that our priority must be to make the dying process as comfortable and bearable as possible. Part of that process will involve the withholding or withdrawal of inappropriately meddlesome therapeutic interventions. That is all part of good palliative care; it is in short good medicine. But Tutu is arguing for far more than easing natural death. He wants to make it legal for doctors to kill people by prescribing legal drugs – and that goes against both the Hippocratic Oath which has for 2,500 governed the practice of medicine, and also thousands of years of the Judeo-Christian ethic as embodied in the sixth commandment ‘Thou shalt not kill’. What disturbs me most about Tutu’s argument are two key arguments that he uses to support his case. 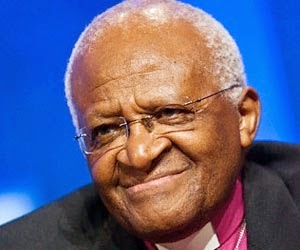 First, Tutu argues that there is a duty for older people to die in order to make way for the young. Such comments play into the hands of the likes of population controllers like Jonathon Porritt, chairman of the UK Government’s Sustainable Development Commission, who in the tradition of Malthus and Ehrlich, warn of ecological and environmental disaster ahead unless we do something rapidly to curb population growth. 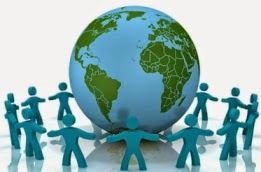 Up until now they have mainly argued that the best way of curbing population growth: contraception and abortion must be at the heart of efforts to combat global warming and couples who have more than two children are irresponsible. But it is a subtle extension of this same argument to say that the dependent elderly should make way for the younger generation by bringing forward their deaths. The right to die can so easily become the duty to die and the generation that has killed its children through abortion could very easily become that which is killed by its children through euthanasia and assisted suicide. Add in economic crisis, debt, cuts in health and welfare and the argument gains force by playing on popular prejudice against those perceived to be a drain on families and the state. In the US state of Washington, where has enacted a law like Falconer’s, over six in ten of those making use of it do so because they believe they are a ‘burden’ on family, friends and caregivers. The law has removed the protection that vulnerable people currently have against the subtle coercion of relatives shouldering the care burden and anxiously eyeing a dwindling inheritance. But the reality is that the overwhelming majority of elderly people want quite reasonably to live for as long as they can in the best state of health that they can. And the mark of a civilised society is that it makes sacrifices for the weak, rather than sacrificing the weak. ‘Bearing one another’s burdens’ is what St Paul said is at the very heart of the teaching of Jesus Christ; it is what true love really is (Galatians 6:2). Second, Tutu argues that lives which depend on heavy medical intervention or technological support are not worth living. I have two close friends who suffer from sleep apnoea so severe that they require CPAP (continuous positive airway pressure) machines to help them breathe at night. They each have a serious disability, and yet with the help of this medical technology are able to maintain ministries as international conference speakers. I think of my many friends from the disabled community for whom technology – motorised wheelchairs, hoists, ventilators, dialysis machines, catheters and a bewildering array of drugs – make the difference between a life of utter dependency and one where they are enabled to function at an unbelievably high level. This is made possible by ongoing research and development, considerable financial investment and a willing supply of helpers and assistants. There is a myth dangerously gaining traction today that medicine and technology have made our lives worse – that people are being kept alive by machines and that this is resulting in prolonged misery. The reality is the opposite. Because of medical and technological advances people are living longer than ever before and enjoying a better quality of life than ever before. And the overwhelming majority of people with terminal and chronic illnesses or disabilities do not want assisted dying but assisted living – help and support to live as long and as well as they can. People who are dying and disabled value their lives in a very different way than those who are able bodied and have a remarkable ability to adapt. This is why disabled people will be rallying in force outside parliament next Friday when Falconer’s bill is debated. They don’t want people like Tutu and others making judgements about whether or not their lives are worth living and suggesting that they are using up valuable resources that should instead be consumed by the young, vigorous and fit. We need to listen to them. At the heart of the Christian story is Jesus Christ, the creator of the universe, who took the form of a servant to seek and save the lost. He brought compassion and healing to the elderly, dying and disabled and gave himself for us walking in the shadow of the cross and bringing the hope of life beyond death. This is where Christians should be today – not campaigning like Tutu for lethal draughts of barbiturate to be made available for vulnerable people whose lives are judged not worth living in order to ease the burden of others who might have to care for them – but getting mobilised to provide time, money and manpower to make the lives of those who are dying and disabled as good as they possibly be until natural death intervenes in good time. Desmond Tutu’s arguments in support of assisted dying will simply fuel existing prejudice against those who are elderly, dying and disabled. They should be seen for what they are and given the short shrift they deserve. 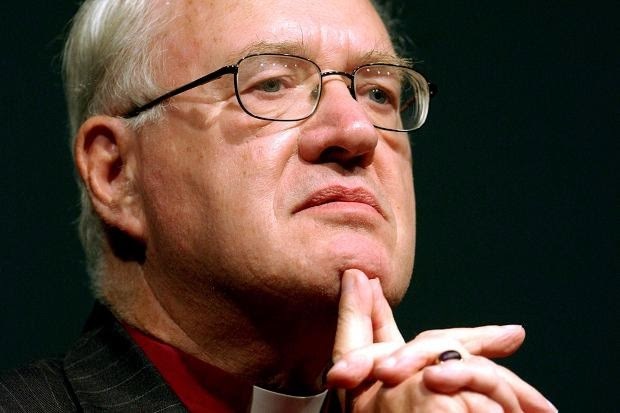 Lord Carey, former Archbishop of Canterbury, has surprisingly come out today in favour of Lord Falconer’s Assisted Dying Bill which is due to have its second reading in the House of Lords on Friday 18 July. Falconer advocates licensing doctors to dispense lethal drugs to mentally competent adults with a life expectancy of less than six months and a ‘settled wish’ to die, in order that they might kill themselves (Falconer calls this ‘assisted dying’ but, legally speaking, it is assisted suicide for a specified subset of people). In response to Carey, the current Archbishop, Justin Welby, has said today that legalising ‘assisted dying’ would be 'dangerous, abusive and mistaken’. ‘Abuse, coercion and intimidation can be slow instruments in the hands of the unscrupulous, creating pressure on vulnerable people who are encouraged to ‘do the decent thing,’ he writes in The Times. ‘Even where such pressure is not overt, the very presence of a law that permits assisted suicide on the terms proposed by Lord Falconer is bound to lead to sensitive individuals feeling that they ought to stop “being a burden to others”. Lord Carey also previously held to the church’s official position but for some reason, which remains a mystery to me even after reading his article today in the Daily Mail, he has now changed his view. I would have to say that I found his article quite unconvincing. But then he says that the cases that have led to him changing his view were those of Tony Nicklinson and Paul Lamb, two men with severe paralysis who were not terminally ill and would not have qualified under Falconer’s proposed law anyway. In so doing he demonstrates the impossibility of framing a limited law that would encompass all who might like to make use of it. The point is that many people who wish to kill themselves are not terminally ill, not mentally competent and not adults. And the vast majority of those who are terminally ill want assisted living, not assisted dying. 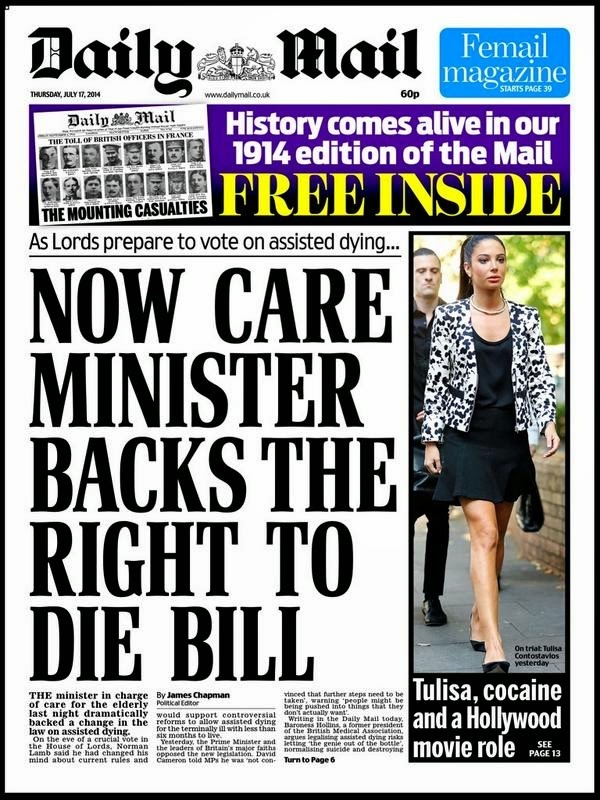 So why a law just for the terminally ill? It seems utterly illogical. Carey focuses on two disabled people with a wish to die but does not tell us that all major disability rights groups in Britain, including Disability Rights UK, SCOPE, UK Disabled People’s Council and Not Dead Yet UK, oppose any change in the law believing it will lead to increased prejudice towards them and increased pressure on them to end their lives. Nor does he touch on the issue of elder abuse, and the way a law allowing assisted suicide brings a huge new dimension into that problem. 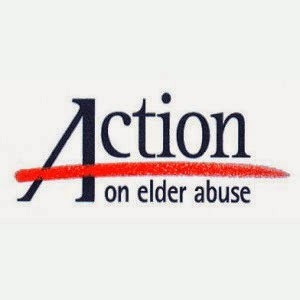 Action on Elder Abuse, for example, states that more than 500,000 elderly people are abused every year in the United Kingdom. Sadly, the majority of such abuse and neglect is perpetrated by friends and relatives, very often with financial gain as the main motive. It would be very naive to think that many of the elderly people who are abused and neglected each year, as well as many severely disabled individuals, would not be put under pressure to end their lives if assisted suicide were permitted by law. Carey also suggests that because powerful painkillers like morphine can occasionally shorten life (although this virtually never occurs in skilled hands because the therapeutic dose is lower than the lethal dose and it is possible to kill the pain without killing the patient) we should therefore dispense lethal doses of barbiturates (not a painkiller but an anaesthetic) with the deliberate intention of killing people. This is to misunderstand the difference between proportionate pain relief, where the intention is to relieve suffering rather than to kill, and assisted suicide where the clear intention is to end a life. The first is good medical practice. The second breaks both the Hippocratic Oath and the Judeo-Christian ethic and has been considered unethical by the medical profession for over 2,500 years. Carey appears not to understand that clear distinction. Carey then cites a BMJ editorial and some comments by a public health doctor (with no experience of managing dying patients) in favour of euthanasia as support by the medical profession for his view. But he fails to tell us that the vast majority of UK doctors are opposed to legalising euthanasia along with the British Medical Association, the Royal College of Physicians, the Royal College of General Practitioners, the Association for Palliative Medicine and the British Geriatric Society. He advances pain as the main driver for a change in the law. But he fails to mention that in Oregon, which legalised ‘assisted dying’ in 1997, fewer than three in ten people making use of the law cite inadequate pain control or (even) concern about it as a reason for wanting to end their lives. The top reasons in Oregon relate to loss of meaning and purpose: loss of autonomy (93%), having less ability to engage in activities making life enjoyable (89%), loss of dignity (73%) and feeling they are a burden on family, friends and caregivers (49%). These are existential or spiritual rather than physical symptoms. Is Carey not aware of this or is he actually being disingenuous? Carey writes about Jesus’s mission being underpinned with ‘compassion’ for those suffering to whom he brought ‘comfort, healing and a new sense of dignity’. But he barely mentions the specialty of palliative medicine or the hospice movement, in large part pioneered by Christians and in which Britain is a world leader, which seeks to do exactly that. Nor does he tell us that symptoms accompanying dying are less to be feared than at any time in history, because of medical advances, and that requests for assisted suicide or euthanasia are extremely rare amongst those who are properly cared for. Nor does he bring a call to make this excellent care much more widely accessible. In fact, to the contrary, he seems to be suggesting that we need to legalise assisted suicide because there is a postcode lottery of hospice care. But what I find most astounding about Carey’s article is the almost complete lack of any theological framework for his argument. There is a vague reference to Christian principles of ‘open-hearted benevolence’ and ‘compassion’ and one mention (above) of Jesus. But there is no discernible Christian world view underpinning what he says. Nothing of the fact that God made us and owns us; nothing of biblical morality or the sixth commandment; no doctrine of the Fall; little insight into the depths of human depravity and the need for strong laws to deter exploitation and abuse of vulnerable people; nothing of the cross or the resurrection; no hope beyond death; nothing of courage and perseverance in the face of suffering; no recognition of the need to make one’s peace with God and others before death; no real drive to make things better for dying patients and no real empathy with the feelings of vulnerable disabled and elderly people who fear a law like Falconer’s and will be campaigning in force outside parliament next Friday. 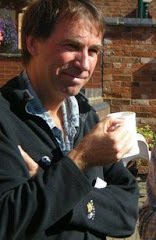 Carey has instead produced a piece that is high on emotion but weak on argument that capitulates to the spirit of the age; that enthrones personal autonomy above public safety; that sees no meaning or purpose in suffering; that appears profoundly naïve about the abuse of elderly and disabled people; that looks forward to no future beyond the grave and that could have been written by a member of the national secular society, British humanist association or voluntary euthanasia society. Carey’s case for legalising assisted suicide is a counsel of despair devoid of Christian faith and hope. I still cannot believe he wrote it. He will disappoint many people, but will also awaken deep concern for him personally in many others. Carey is a good man who has done a lot of good. But right now I think he actually needs our prayers.